At Macalester College, over the previous few years we had developed a new titles web page that used PHP to access new titles data in a MySQL database. This page was developed in-house and utilized a library server which was outside the traditional realm of the institutional servers and thus was lightly supported by Macalester’s Information Technology Services (ITS). This support meant there were backups of the server but no updates to the operating system or any of its applications. The existing process for updating the new item data involved first exporting data from OCLC’s WorldShare using the WMS Report Designer. Next, we took this data, which was in a tab-delimited file, and imported it into a MySQL database using a PHP script. This script did some text conversion as well as retrieved the new titles’ cover image. This process had worked well for the library during a one to two year timeframe with minor changes and enhancements. Historically the DeWitt Wallace Library doesn’t purchase a large amount of new materials. Typically we see about two hundred and fifty new titles in a month with an average of three to four thousand in a year. The number of titles each week fluctuates during the academic year with the spring having more than the other seasons. This fluctuation is of course a result of many factors but like many academic libraries, static budgets and falling circulation have affected purchasing. With these kind of numbers throughout the year, updates to the new title page traditionally occur every other week. Finally, new item records are given a two to three day window for processing to ensure items on the web page are actually in the library. Although the existing new titles page was working and satisfied our needs, we began to re-assess it due to several factors. First, and most important, was that ITS had informed us our server’s operating system was no longer going to be supported and thus was slated for retirement. Without support, we could no longer depend on the web pages and applications that were on that server. Besides the operating system, individual software programs were extremely old, too. In particular, PHP and MySQL, main components in the existing new title list, were several versions behind current acceptable ones. Without having updates to the operating system and main software running the new titles page, the library and the college were exposed to security risks and vulnerabilities. Our first attempt, but ultimately a failed one, was to utilize the Awesome Table Google Sheet template. This was a fairly robust solution where data was housed in a Google Sheet and then included within a web page via an HTML iframe tag. The tool came with filtering, searching, and pagination and seemed like a perfect fit, except that during our testing typical load times for the page averaged 12 seconds. While loading the data from the Google Sheet, the tool did display a small blue progress bar to show that it was processing, however, the 12-second delay was too long and we decided to look elsewhere for a solution. After working with the Awesome Table product in which a Google Sheet was used to store data, housing the new titles data in a Google Sheet seemed like a solution to many of our proposed criteria. Housed in a spreadsheet, the data could easily be updated and new rows added, therefore addressing our criteria of maintainability. However, as we discovered with Awesome Table (or even researching other tools like Tabletop.js), the Google Sheet API, as others have pointed out, may not be production worthy. There is concern that Google could put rate limits on access, may be adding extra load to the display, and with a publicly accessible Google Sheet, an ill-intentioned person could traceback the API calls to access the data. The epiphany in finding a solution came when realizing that the Google Sheet housing our data could be used as a tool to create the HTML display as well. If we create HTML code that could then be copied into a CMS-housed page, although not automated, it could be a simple process to update the new item data and thus populate our new items page. After deciding to use the List.js tool, the development path became fairly straightforward. First we would need to create an HTML page with the List.js and Pagination plugin. Next, we would get each item’s book cover image, which was not part of our data extract. Third, we would need to concatenate all of the data into an HTML title list that could be part of an include file. Finally, we would include that file into the HTML page to dynamically generate our new titles list. In the end we would have a Google Sheet that houses all of the data, an HTML file that lives in our CMS which displays the data, and an include file that contains the HTML new titles list which is dynamically included into the main HTML file. In this way we would compartmentalize the data, display, and include file. To start, we built an HTML page that formatted a basic set of test data which allowed us to fine tune the display. Utilizing our campus pattern library, we quickly created an HTML item list of eight items that had book cover images, each to the left of the tile and author. Next, we integrated the List.js and its Pagination plug-in into the page, allowing us to test the filtering by item type (i.e. Book, DVD, etc.) and purchase department (i.e. Chemistry, English, etc.). 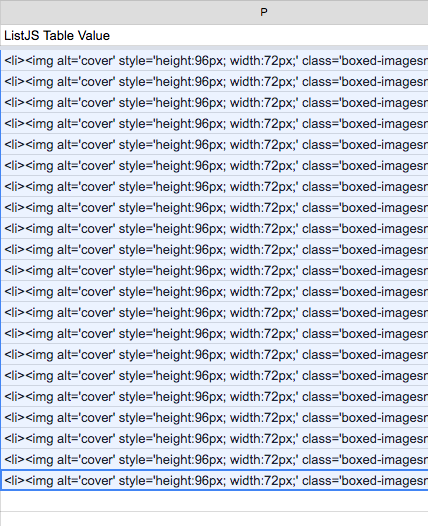 The filtering was accomplished by including these data values in the HTML with hidden tags. Even when hidden, List.js is able to use this data for filtering based on user choices. 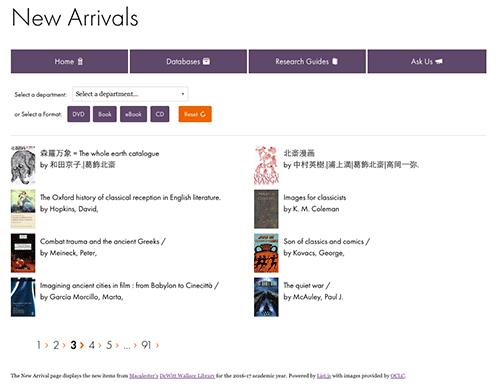 <p style="font-size:small;">The New Arrival page displays the new items from <a href="http://www.macalester.edu/">Macalester’s</a> <a href="http://www.macalester.edu/library/">DeWitt Wallace Library</a> for the 2016-17 academic year. Powered by <a href="http://www.listjs.com/">List.js</a> with images provided by <a href="https://www.oclc.org">OCLC</a>. In our Google Sheet, using string functions, we would concatenate the data from each item with the required HTML tags to get an HTML item list code. The HTML file with the List.js and pagination code, and the file with the HTML item list code would both be housed in our CMS. Before we discuss how the new items cover image is retrieved, it should be mentioned that the DeWitt Wallace Library at Macalester College was able to work with OCLC to secure approval to use their images in our new titles web page. The method we use is inline linking, or hotlinking. From our web page, we reference the URL of OCLC’s image. An image appears to be part of the new titles web page, but only virtually, in the sense that the image file is not physically present on a Macalester server. The actual location of the image file is at OCLC and no downloading or copying of any images occurs using this method. Besides the cover image, most of the required information needed for the new items page is within our exported data. That exported data is kept in a Google Sheet and over time new item data is added to it. However, to get the item’s image we need to perform a different kind of search in a separate Google Sheet. First, we copy just the new items’ OCLC numbers from the master Google Sheet into a column in a working Google Sheet. Because the importXML function we use to get the image will re-request the information when a Google Sheet is opened, we perform the image search separately from our master Google Sheet. This ensures that as the number of new items increase in the master file, the Google Sheet isn’t calling that function again and again. We use the importXML function to extract the image URL from each item’s web page. ImportXML is essentially opening the new item’s OCLC web page and using the XPath query language to search for the URL of the item’s cover art in the HTML. 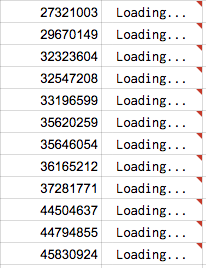 Performing this action for several OCLC numbers can take a while and some rows will be stuck in the “Loading…” phase. We found one to two hundred OCLC numbers may take up to an hour to populate. With patience all the image URL’s will be populated and can be copied over to the master Google Sheet. In this way, the image URL value, not the ImportXML function, is available to be included in our new title list. Lucky for us, the new process uses the same data export process with the WMS Report Designer in OCLC’s WorldShare. With our data exported, it is a simple process to copy the new rows into the master Google Sheet, adding them to the new items’ data. This file builds upon itself so new rows are just added to the end. Most of the data itself is self-explanatory, but the “Fund Code” is a field that we use to designate which fund was used to purchase the new item and coincidentally it also represents the academic department. Utilizing a NamedRange in the Google Sheet, we are able to translate the Fund Code: for example, changing “bhis” to History. Next, to create the item link to our catalog, we utilize the OCLC number (ex: https://macalester.on.worldcat.org/oclc/10694032). Finally with all of the necessary values populated, we can concatenate the data into one string. Resulting in HTML item list code for each item. When each row’s data is combined and then included with the HTML file containing the List.js logic, the new titles page displays with the appropriate styling and logic. To finish, we simply select the entire column with the HTML list item code, then copy it into the include file. This results in a finished new titles web page. Example HTML item list code Figure 5. Going forward, to update the new titles page with new data, we will only need to copy the new rows from the HTML items list column in the Google Sheet to the include file. During a typical update process, which usually happens every other week, it might take 15-20 minutes to update the new items page. This isn’t continuous, as the image cover process can sometimes take an hour to retrieve two hundred cover images. However, the image URL retrieval doesn’t need to be monitored and can occur simultaneously to other work. Also, prior to the addition of new titles, we also create a backup of the master Google Sheet that holds the data. This helps to ensure that if any problems occur during the update, we can revert back to a previous version. With only four months using the new version, it’s hard to make any statements regarding increased or decreased use of the new titles page. The actual page-views of the new page are slightly higher than the previous system over a similar time frame, but more time is needed to see if this is a bigger trend. In all honesty, the move to the new system wasn’t to garner more views, although that would be nice too, but, as mentioned elsewhere, the benefits were to eliminate the security risks of the old server, improve the update process, and integrate the new titles page into our CMS. Finally, as a proof of concept, in our testing we duplicated the number of rows to match a typical year’s worth of new items, about four thousand, and List.js performed wonderfully with only a 2-3 second delay, depending on the browser, in generating the web page. John Meyerhofer is the Digital Scholarship Librarian for the DeWitt Wallace Library at Macalester College in St. Paul Minnesota.